The campus capped off its annual Student Achievement Week with a prestigious award ceremony recognizing the outstanding achievements of students and instructors. The 2010 Undergraduate Academic Achievement, Excellence in Teaching, and Mentoring Awards ceremony and reception drew more than 300 well-wishers to the Colleges Nine & Ten Multipurpose Room. The Steck Family Award honors the best senior thesis completed during the academic year, with the winner chosen from the Chancellor's Award candidates. This year's winner is senior Caitlin Doughty, an environmental studies major whose thesis, "Petroleum Extraction, Markets, and Connection to Place: A Comparative Study of Two Huaorani Communities in the Ecuadorian Amazon," arose from her travels to the Ecuadoran Amazon. There, she worked with the Huaorani, a tribe of people known for their self-sufficiency, their preservation of custom and ritual and their suspicion of outsiders. Doughty will receive bound copies of her prize-winning work and a $1,000 honorarium. In her thesis, Doughty profiled the ways that the lifestyles of one Huaorani group changed as a result of living near an oil concession. Doughty compared the lives of two groups of Huaorani--one that lived along an oil road and another whose members dwelled deeper in the forest and far from towns and roads. At the ceremony, her thesis advisors Flora Lu and Jeffrey Bury praised her for "ethnographic detail that shows what our petroleum addiction means to groups like the Huaorani." 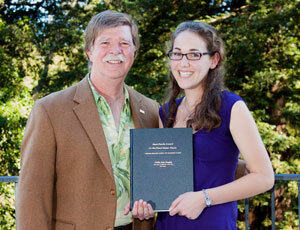 UCSC alumnus Loren Steck was on hand to present the Steck Family Award to Doughty. He declared that the theses he read during the selection process proved that UCSC's outstanding students are producing work that can compete with "elitist private schools." These awards recognize outstanding achievements by undergraduate students. Ten Deans' Awards are awarded to students within each division (Arts, Engineering, Humanities, Physical & Biological Sciences, Social Sciences). Of those students, up to three in each division can be selected to receive a Chancellor's Award. Students as well as their mentors were recognized at the ceremony. Professor emeritus of biology at UCSC Kenneth Thimann and his wife, Ann (both now deceased), established this pledge of support to UCSC in recognition of future UCSC graduate science scholars. The scholarship award of $2,000 is intended for use in graduate studies. The Excellence in Teaching Awards are given each spring to selected faculty who engage students through innovative course designs, special learning techniques and materials, and their own personal qualities as teachers and mentors. In selecting awardees, the committee considers nomination letters written by students, as well as statements submitted by the nominee and his or her department chair and/or divisional dean. The committee looks for evidence that the nominee has thought deeply about teaching and learning, and effectively applies that thinking in the classroom. Presentation of the Teaching Awards was by Chancellor George Blumenthal.